The future of ultra-premium land transportation is here, and it comes with a spacious interior that morphs to support an immersive entertainment experience or a business meeting with the swipe of a smartphone. the unlimited flexibility, versatility and capability of the all-new Transit, which goes on sale this summer. Transit Skyliner embodies the spirit of luxury motor coaches and builds on the heritage of custom vans, showing how Ford Transit can be transformed to fit the needs of limousines and high-end transportation services as well as commercial fleets, shuttle providers and small-business owners. The entire interior - from seats to LED mood lighting - is integrated into a Crestron automation system controlled through a smartphone or tablet. The entertainment system also features Focal Utopia 7.2 surround sound with speakers handmade in France specifically for Transit Skyliner, a KVH DirecTV satellite for HD TV and a Kaleidescape media server with storage space equivalent to more than 300 Blu-ray movies or more than 1,000 DVDs. Refreshments can be served from Transit Skyliner's built-in bar. Matching custom luggage complements the vehicle's one-of-a-kind leather-trimmed seats. "Traveling in Transit Skyliner is an experience unlike any other," said Tim Stoehr, Ford Manager for Commercial Truck Marketing. 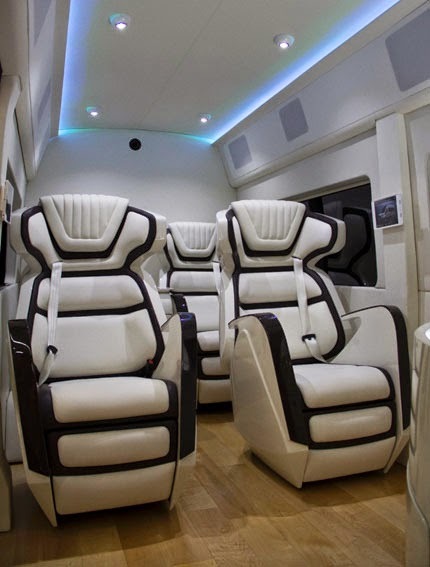 "You step into the vehicle and are immediately immersed in the custom interior and high-tech audiovisual environment. The next thing you know, you are arriving at your destination." The exterior of Transit Skyliner features a custom silver metallic paint scheme accented by contrasting lower trim, chrome highlights and custom Forgiato wheels. The dynamic design reflects Transit's modern, European look. "Transit Skyliner is the ultimate expression of a custom Transit," added Stoehr. "We created the vehicle to highlight the potential of the Ford Transit platform for the limousine market and to showcase Transit as the next-generation of modern, cool, fuel-efficient vans." Transit Skyliner features the 3.5-liter EcoBoost engine available on Ford Transit. With 487 cubic feet of cargo volume and an interior height of 81.5-inches in the long wheelbase/extended body high-roof model, Transit can be personalized to create a private jet for the road. Its unique custom limo design proves the capabilities of Ford Transit go beyond the needs of shuttles, commercial fleets and general contractors. The 2015 model year Transit will offer two wheelbases, three roof heights and three powertrains to accommodate multiple needs without body modifications. The exterior design for the Transit Skyliner originated out of Ford of Europe's Design Studio in Dunton, England, and its execution was led by Melvin Betancourt, a Ford Design Manager, and Galpin Auto Sports President Beau Boeckmann. "We are sincerely excited to work with Ford in creating the future of luxury travel," said Boeckmann. "Tapping our history of creating the conversion van segment in the 1960s and '70s, as well as our recent high-tech work, together with Ford we have brought the modern ultra-premium van to life." 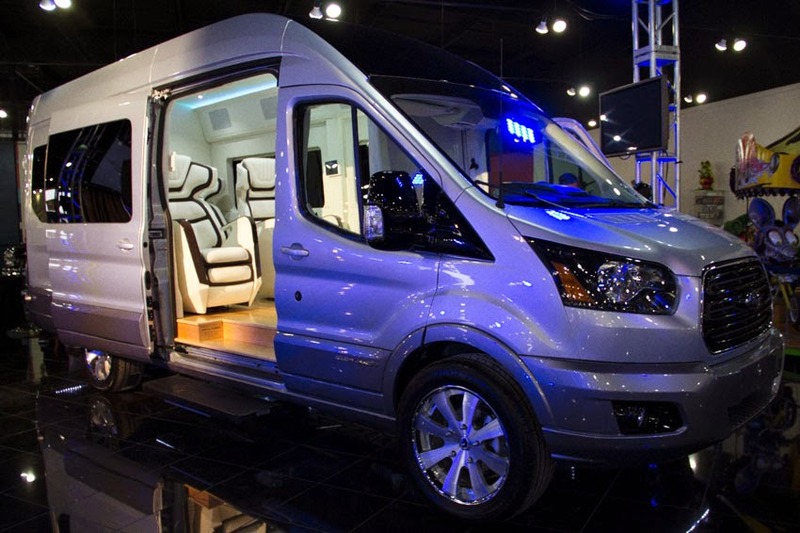 "Galpin is especially excited about the launch of the Transit, which builds on Ford's commercial van leadership with a new design, making it the perfect platform from which to modify," added Boeckmann. Transit Skyliner will make its auto show debut at the New York International Auto Show on April 16 at Jacob K. Javits Convention Center.